Friday 5 minute blog : January – Dirty wet dog , boats and sailing. With so much going on now i can think about increasing the blog output back to twice a week again. The longer, main posts do take me a lot of time especially when i try and be all arty-farty with the filming whereas i can do a quick update ‘fast and dirty’. What i intend to do each month is write up, or film, a quick 5 minute blog about the things i have actually got done that month rather than the things i have thought about getting done. So, this will be the first one and basically what things i got finished or at least worked on during the month. First this month i managed to both get into the yard rowing boat and get out to WABI”’ and bring her alongside against the yard pontoon. That was genuinely the first time i had been aboard the Liberty since my knee replacement in the summer last year. It’s also the first time that i have had to scramble up and down the greasy yard ladder down to the pontoon during a full spring ebb. The big job i got done in January was fitting the pansy stove although the job isn’t totally finished as the deckhead lining has to go back in and doing that job did entail stripping the main switch panel out. Today as i write, i have been to the yard and fired it up for the first time and very nice it was too to sit inside the boat snug and warm with snow and hail landing on the deck. The hardware shop in town was very surprised when i went shopping for lumpwood charcoal in January ! Other jobs on the boat : i have been doing some shopping for materials for the sprit-rig set-up, that job is ‘on the bench’ right now for the first one which will be an experiment with the mizzen. I have been trying to source some external sail track for the main mast which is part of the same project but come up blank so far. In the workshop itself i fitted the new larger bench top and made the scrap plywood bin, bought and fitted an engineers vice to the other end of the bench and yesterday went and had a bit of a blow-out at the DIY superstore in town. Iv’e wanted a power planer for some time but really wanted a cordless one so i splashed out on one from the same maker as my 18v cordless drill which is excellent if a little heavy. The battery was over a hundred squid….almost as expensive as the tool ! On the bench right now are the side ‘wings’ carcasses for the 3 part display case that is going to go above my work desk and will form a rolling display there. The centre one is made and primed but still needs the angled-cleat pattress hanger making. Yesterday while i was bashing the plastic in town i went to ‘Marine bazaar’ down in Plymouth which is the best place for boat bits in the whole area. They have a stack of old charts and i had a quick shuftie through the first 20 or so to find a backdrop for one of the displays….i haven’t quite found what i was looking for (the Horn would be nice) but i needed more time to rummage so a return trip is in order. I have filmed and edited 2 short video clips that are out on youtube that have a bit of what i am trying to put across about boats and sailing and aren’t just me being a ‘talking head’ . I spent quite a bit of time trying to work out how to do more things with the video editing software . This month i have invested in a bit more gear with a video light and an intervalometer. The video light should allow me to film in the workshop in poor light and film inside boats. The intervalometer is for doing time-lapse photography which is something i want to have a go at for the film work. 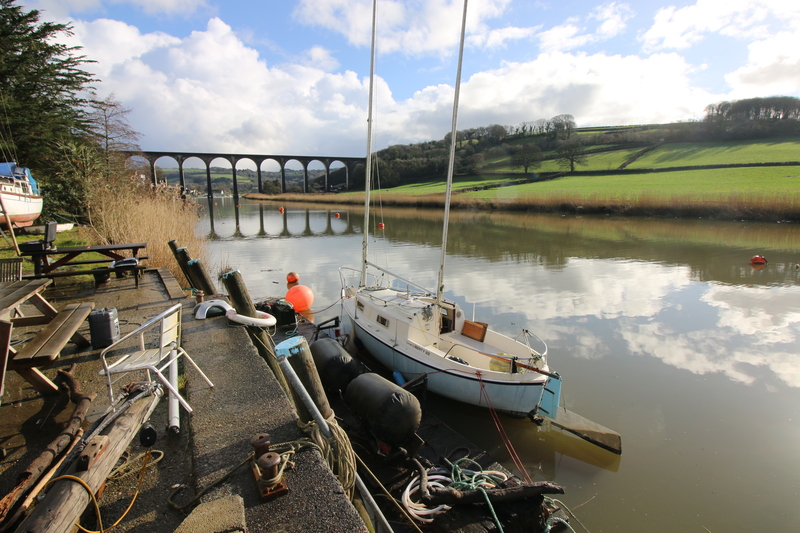 For this blog i played with my ultra-wide angle lens down at the yard, the results from that suggest that i should be able to get better internal boat shots. The big and expensive problem of the month was the diesel injector pump on the car dying. It’s an old ( 21 years) Pajero and therefore not only a ‘grey’ import but hard to find parts. I managed to track down another Pajero being broken in a breakers yard and got the pump off that one. The expensive part was the 6 or 7 hours labour stripping down and fitting the new one. That pretty well blew out the boat budget for the month aside from buying the new vice and a few odds-n-ends and does mean that i have to get through another month at the orifice-office so that i can start thinking about the more expensive jobs on the boat…..new and better sails being high on the list. Work is…..work, it’s helping to pay the refit bills but i am really starting to dislike just being there, the job itself being totally routine and unsatisfying. By the end of a working day my back is really not happy, neither am i !. Today just being on the boat showed me just how much i like being back on the boat and how little i look forward to my early start at the hospital tomorrow. On the boat today, with the pansy stove going and a mug of coffee on the go, i had a few minutes to just sit and enjoy watching the river flow past outside and listen to the hail hitting the deck just overhead. I don’t know what it is with WABI”’ but i am always happy when i am aboard even when i am just tinkering with jobs. During February i have to make the crucial decision whether to continue working, which i now all-but hate just being there, or knock it on the head and go off sailing for a while. Some more funds in the boat budget would be handy because i really would like some new sails , some custom canvaswork and really a new motor. I am getting close to the point where i am just going to pack up and leave though. Previous A Golden age….but for who ? Next WABI”’ refit, 1 : Bring on the heat. More proof that there’s nothing half so much worth doing as messing about in boats. Looking forward to the videos and blog posts Steve.